Hotel portion of Alexander-Quartier in Berlin. The topping-out ceremony for Alexander-Quartier took place yesterday afternoon in the presence of numerous guests from politics, business and the media. 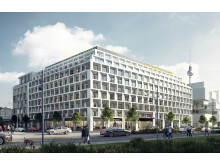 The urbane and lively city development with hotel and office use is being built in the immediate vicinity of Berlin’s Alexanderplatz and the Alexa department store. 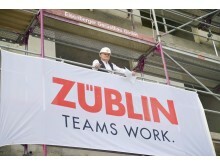 General contractor for the eleven-story hotel and office complex (including basement and attic floors) is ZÜBLIN. The modern mixed-use development being built on an approx. 4,900 m² plot of land offers a gross floor area of 29,560 m² with 475 hotel rooms and 8,300 m² of office space as well as an outdoor fitness area, a restaurant with bar, and library and study areas. 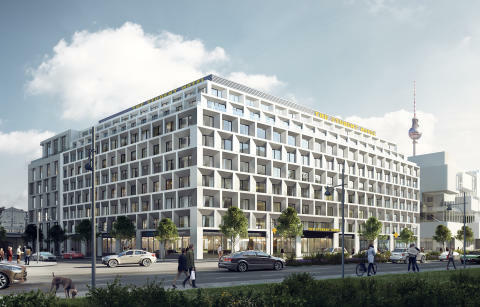 ZÜBLIN is building the underground car park and the hotel wing turnkey and the office section as a shell. The Stuttgart-based construction company is also carrying out the façade work. The sculptural façades are divided into a base area topped by standard floors and staggered/stepped floors. 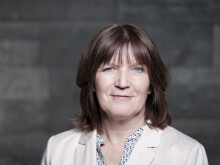 The client of the project, which has a value in the high double-digit million euro range, is, for the office portion, a project company of the European Student Housing Fund and, for the hotel portion, a joint venture consisting of European Student Housing Fund (70 %), represented by Frankfurt-based BaseCamp Student GmbH, and The Student Hotel (30 %), which will also operate the hotel. The building was designed by KSP Jürgen Engel Architekten, with construction design by pbr Planungsbüro Rohling AG. Overall completion of Alexander-Quartier is scheduled for the second half of 2019. 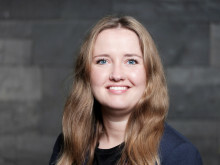 The Student Hotel group currently has some 4,500 hotel rooms in Amsterdam, Rotterdam, The Hague, Eindhoven, Maastricht, Groningen, Barcelona, Florence, Dresden and Paris. More rooms will be coming soon in Berlin and Bologna. By 2020, additional locations with a total of 15,000 beds are to be available to guests through acquisition and development in Germany, Italy, France, Spain, Portugal and the United Kingdom. The company WeWork, which designs, builds and operates modern and flexible work areas around the world, has already signed the lease for 8,000 m² of office space including outside areas. BaseCamp Student GmbH is part of BaseCamp Europe Group, a developer and operator of student residences for the European Student Housing Fund (ESHF) and other institutional investors. With offices in Berlin, Copenhagen, Frankfurt, Warsaw and London, the company acts as a consultant to the European Student Housing Fund and other institutions investing in student housing. 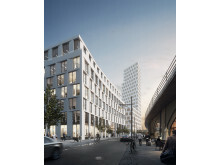 Brick Visual/KSP Jürgen Engel Architekten, Berlin. Office portion of Alexander-Quartier in Berlin. Joachim Lange, foreman Ed. ZÜBLIN AG, reciting the topping-out speech.